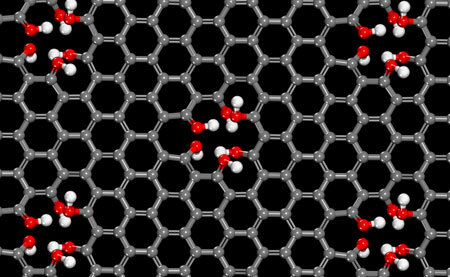 (Nanowerk News) The honeycomb structure of pristine graphene is beautiful, but Northwestern University scientists, together with collaborators from five other institutions, have discovered that if the graphene naturally has a few tiny holes in it, you have a proton-selective membrane that could lead to improved fuel cells. A major challenge in fuel cell technology is efficiently separating protons from hydrogen. In a study of single-layer graphene and water, the Northwestern researchers found that slightly imperfect graphene shuttles protons -- and only protons -- from one side of the graphene membrane to the other in mere seconds. The membrane's speed and selectivity are much better than that of conventional membranes, offering engineers a new and simpler mechanism for fuel cell design. "Imagine an electric car that charges in the same time it takes to fill a car with gas," said chemist Franz M. Geiger, who led the research. "And better yet -- imagine an electric car that uses hydrogen as fuel, not fossil fuels or ethanol, and not electricity from the power grid, to charge a battery. Our surprising discovery provides an electrochemical mechanism that could make these things possible one day." Defective single-layer graphene, it turns out, produces a membrane that is the world's thinnest proton channel -- only one atom thick. "We found if you just dial the graphene back a little on perfection, you will get the membrane you want," said Geiger, a professor of chemistry in the Weinberg College of Arts and Sciences. "Everyone always strives to make really pristine graphene, but our data show if you want to get protons through, you need less perfect graphene." The study will be published March 17 by the journal Nature Communications ("Aqueous Proton Transfer Across Single-Layer Graphene"). Geiger's research team included collaborators from Northwestern, Oak Ridge National Laboratory, the University of Virginia, the University of Minnesota, Pennsylvania State University and the University of Puerto Rico. When Geiger and his colleagues studied graphene exposed to water, they found that protons were indeed moving through the graphene. Using cutting-edge laser techniques, imaging methods and computer simulations, they set out to learn how. The researchers discovered that naturally occurring defects in the graphene -- where a carbon atom is missing -- triggers a chemical merry-go-round where protons from water on one side of the membrane are shuttled to the other side in a few seconds. Their advanced computer simulations showed this occurs via a classic "bucket-line" mechanism first proposed in 1806. The thinness of the atom-thick graphene makes it a quick trip for the protons, Geiger said. With conventional membranes, which are hundreds of nanometers thick, proton selection takes minutes -- much too long to be practical. Next, the research team asked the question: How many carbon atoms do we need to knock out of the graphene layer to get protons to move through? Just a handful in a square micron area of graphene, the researchers calculated. "Our results will not make a fuel cell tomorrow, but it provides a mechanism for engineers to design a proton separation membrane that is far less complicated than what people had thought before," Geiger said. "All you need is slightly imperfect single-layer graphene."